For some servicemembers, the decision to stay in or get out of the military is easy. Either they know that their time served is complete and they are ready to transition back into civilian life or they knew from the day they signed that they wanted to stay in for a certain number of years, whether that time was twenty years to retirement or even longer. But for some servicemembers, making the decision to stay in or get out of the military is not so easy. Many military members don't have a clear conviction of what is right for them or their families. So when do you start having these discussions? At what point in your spouse’s military career do you entertain the idea of civilian life once again? What signs should you be watching for over the years that may provide a clear indication? Are there any clear indications? How do you ultimately find peace in making this decision? These are the questions I sought to answer as I began talking to six active duty servicemembers and their families. Here is what I found. Family #1 has served in the United States Army for 20 years and is looking at retirement in the next five years. The decision to stay in or get out has been brought up after each milestone achieved during his active-duty career. However, now that he's been recently promoted, the discussion has been brought up once again. They are now thinking of leaving within the next five years. For their family, there is a great deal of weight upon what the next assignment holds. If he receives orders for the assignment he put in for, they will most likely continue. However, if he does not, they think it might be best to say goodbye and move on. His career with the Army has kept him away from home for a large majority of the last 20 years. Whether he was deployed or simply on the road, he was absent while wife and mother made a great deal of sacrifices keeping everything in place at home. For them, there was no distinct event that indicated it might be time to move on. Instead, it has been a gradual development as exhaustion from the pace and sacrifice associated with the military lifestyle set in on the rest of the family. The thing that has kept them going over the years is the active duty spouse’s strong need to honor and serve our country. While frustrations are present most days in the military spouse’s life, she remembers that he is doing what he feels he was put on this earth to do. Although her life may not be fulfilling in the way she once envisioned, knowing that he is fulfilled makes it possible to keep going. You can never prepare too much for the transition and understand the pay-scale difference. For example, accepting a civilian job that pays the same as your military pay may not be worth it since you will have additional insurance and other expenses that arise with the change. You may need to be willing to change your standard of comfort or take some time to find the right fit for you and your family. Family #2 has served in the Air Force for 19 years. Throughout their military career, Family 2 reevaluated their time with the Air Force at each promotion and found that his goals continued to progress and he is still enjoying his experience with the military with each milestone. Over the past nine years, however, they have noticed a dramatic decrease in servicemembers from his year group. He says that many of his peers went on to work a similar position on the outside, pursued entrepreneurship, or left to focus more on their spouses and families. While he understands the niceties that civilian life has to offer, his personal dedication to service and the job security of an active duty position deters him from considering retirement. Additionally, he feels that the Air Force has entrusted him with the education and skills to further advance the mission of defending our nation. With the ongoing military presence around the world, there is a constant need for military personnel because of these things, and he says he will continue on his chosen path. Family #3 has served in the Marine Corps a little over two years and plans to get out at ten. This Marine was aware early on that his service with the military needed to be short. He originally chose his path to be an asset to his country by way of the Marine Corps. Unfortunately, even in his short time as an active duty officer, he no longer feels that he has been given the ability to serve his country to his fullest. Feeling that he could not take pride in his work, he decided that it is best for him to transition into civilian life at the first available opportunity for his sake and for those serving with him. Family #4 has served in the United States Marine Corps for eight years and will be completing their time with the military at the ten-year mark. After starting out their time with the military, it was once assumed they would spend a full twenty years active duty and then retire. Shortly before the second deployment, they welcomed their oldest daughter to the world and the active duty spouse and father felt that he was missing crucial moments for the family and began lightly speaking of leaving the military earlier than they originally planned. While his spouse supported his thoughts and feelings, she did not put a lot of weight to these conversations and assumed that they were stemming from frustrations that accompany a life in the military. A couple of years ago, however, these discussions became more and more serious and most recently, they have decided it will be best to leave the military at the ten-year mark. No one knows better than families making the transition back into civilian life just how difficult it can be. 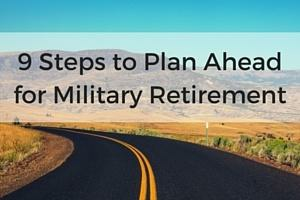 This military spouse urges other families facing this same decision to have a plan. “The hardest thing for me in all of this is my husband saying to me, ‘I want to get out, but I'm not sure what I'm going to do yet.’ " Review your options and plan as much as you can in advance. Family #5 has served in the Air Force for over 30 years and plans on retiring within the next year. Family 5 first began discussing whether to stay in or get out of the military at the traditional ten-year milestone. Though at the time, neither active duty nor spouse thought that that discussion would lead to a whole twenty more years! When they made their decision to stay in the military, perceived perks of civilian life had little influence. For this family, the fact that they identified with the military lifestyle and enjoyed it as well as the benefits of the GI Bill, satisfaction of serving our country, and continuing to move ahead in rank encouraged them to continue their time as an active duty military family. They also considered factors brought to mind by having a large family. For example, insurance and housing, as well as the fact that they wanted their kids to travel. Because they made the decision to stay in, their kids have lived all over the world and had many experiences that they would not have if they'd decided to get out of the military and settle somewhere permanently. This family's faith plays a big role in every decision they make, so of course they prayed and thought about it and made the decision based on what they felt the most peace about. Family #6 has served for over 30 years in the Army and does not plan on retiring soon. 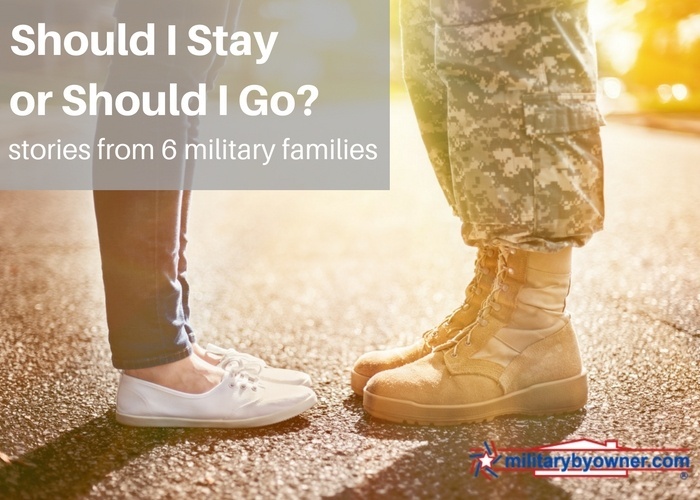 Like many other families that you’ve seen, the discussion of staying in or getting out of the military first arose around the eight- to ten-year mark. For this family, civilian job availability was and is certainly a variable to be considered when deciding whether or not to stay in the military. They've felt that, since the active duty spouse really enjoys each of his jobs, has received high evaluations all throughout his career, and the family is happy with the lifestyle, that they will continue their time with the military. The military member encourages those deciding to stay in or get out of the military that “at the end of the day, loving what you do is of utmost importance. But equally so, especially if you have a family, are job security and all that goes with it.” The decision to stay or retire has to be made together, with each spouse contributing equal say. Even more simply, the answer to whether to stay or go comes down to the equation of years served plus probability of promotion plus job prospects in the civilian world. Within that, family wellness and happiness need to be strongly factored in. Maybe you identify with one of these six families. Maybe you don’t. Does your family find their identity in being a “military family”? Is your family able to cope with deployments and time away? Is there a good chance of promotion? Is the non military spouse’s career being sacrificed due to PCS moves? How might family earnings potentially change if the spouse is able to more fully pursue a career? Have you carefully researched what is available and what you may qualify transitioning to civilian life?